Ureteroscopy has evolved considerably over the past decade, and the currently available scopes and instruments permit the ureteroscopic treatment of calculi within any location in the urinary collecting system. Earlier ureteroscopes had limitations in visibility and flexion, which was further exacerbated when combined with adjuncts such as baskets or the laser fiber itself. Such limitations were most apparent in treatment of lower pole renal calculi. Additionally, patient factors (e.g. morbid obesity) or stone factors (e.g. increased Hounsfield density or radiolucency) plays little role, if any, in the ureteroscopic management of stones. Excessive stone burden continues to be the main limiting factor for retrograde stone management, but in cases where other options are contraindicated, e.g. in the anticoagulated patient, URS still prevails as a preferred option. Lower pole renal calculi are some of the most challenging of ureteroscopic cases. This is largely due to the greater instrument manipulation that is necessary to target and treat the stone; second, stone clearance is impacted by this undesirable stone location. We discuss the treatment of lower pole stones by one of two techniques: in situ versus stone distraction/displacement. Both techniques are acceptable methods of lower pole stone management and are largely based upon the expertise and comfort level of the treating surgeon. Lastly, we discuss the necessary instruments and tools required to perform successful ureteroscopy for stone disease. Further, we provide a detailed description of our technique. 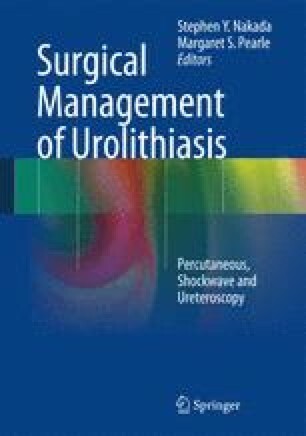 The aim of this chapter is to provide the reader an in-depth understanding of contemporary URS for the management of renal calculi, with specific focus on lower pole calculi.